President Barack Obama established Bears Ears National Monument on primarily undeveloped land in Southeastern Utah in 2016, with co-management by BLM, US Forest Service and a coalition of The Navajo Nation, Hopi, Ute Mountain Ute, Ute Indian Tribe of the Uintah and Ouray Reservation and the Pueblo of Zuni. Though President Donald Trump has attempted to reduce the monument by 85%, legal challenges have so far preserved the land. 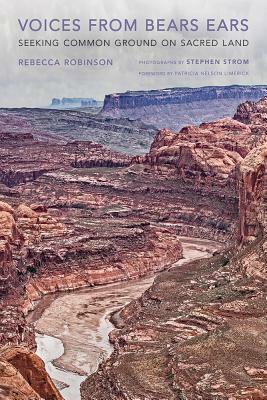 Rebecca Robinson has edited a collection of 22 individual voices and personal histories of those involved in the debate about the future of the monument in her book, Voices from Bears Ears: Seeking Common Ground on Sacred Land (University of Arizona Press). Photographer Stephen Strom, whose photographs also appear in Voices in Bears Ears as well as in his book, Bears Ears: Views from a Sacred Land (University of Arizona Press), has created an awe inspiring visual celebration of the rugged beauty of the canyons, mesas and spires of Bears Ears. Please join us for a conversation with images to learn more about this national treasure.